"Man was born free, but everywhere he is in chains. This man believes that he is the master of others, and still he is more of a slave than they are. How did that transformation take place? I don't know. How may the restraints on man become legitimate? I do believe I can answer that question …"
Thus begins Rousseau's influential 1762 work, Du Contract Social. 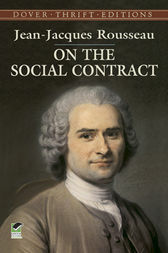 Arguing that all government is fundamentally flawed, and that modern society is based on a system that fosters inequality and servitude, Rousseau demands nothing less than a complete revision of the social contract to ensure equality and freedom. Noting that government derives its authority by the people's willing consent (rather than the authorization of God), Rousseau posits that a good government can justify its need for individual compromises, rewarding its citizens with "civil liberty and the proprietorship of all he possesses." The controversial philosopher further suggests that promoting social settings in which people transcend their immediate appetites and desires lead to the development of self-governing, self-disciplined beings. A milestone of political science, these essays introduced the inflammatory ideas that led to the chaos of the French Revolution, and are considered essential reading for students of history, philosophy, and other social sciences.